This time we go traditional, but south Italian traditional. Aaand we pick from the other side of the family tradition. Aaand from another Grandma that I unfortunately couldn’t meet in person, but I feel like I did. Nonna Maria was my mother in law’s mother. She was a beautiful person, with a strong personality, and endless curiosity and will to learn new things. 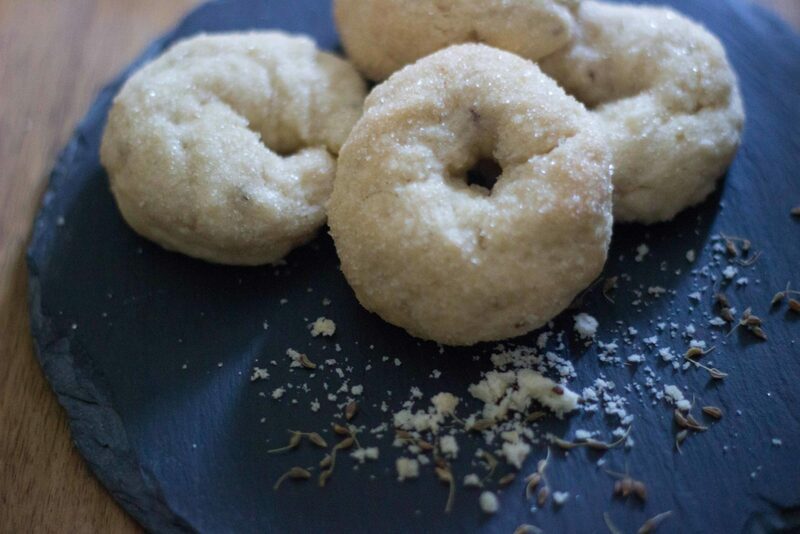 One of the dishes my husband loves the most are these anise and wine cookies, from the roman tradition. I have to be honest, I am not a big fan of anise, I generally think it is too strong (and also my paternal Granny fed me anise candies as a little child, and I think I have a sort of trauma) but once mixed together with the other ingredients, and lots of love, well, I can’t stop eating these cookies! 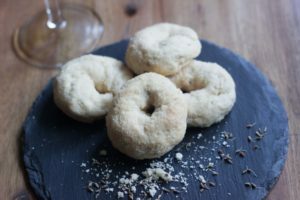 The recipe is so absolutely simple and the taste so absolutely special that I am sure, you will adore it! Oh and by the way: these are vegan too… thanks Nonna Maria! In a cup, mix the wine (I chose a brut sparkling wine) and the anise seeds and set aside. In the standing mixer bowl, mix all the dry ingredients. Add the wine and the oil and give it a stir until combined but still crumbly. If it seems too dry, add a bit of wine or water. 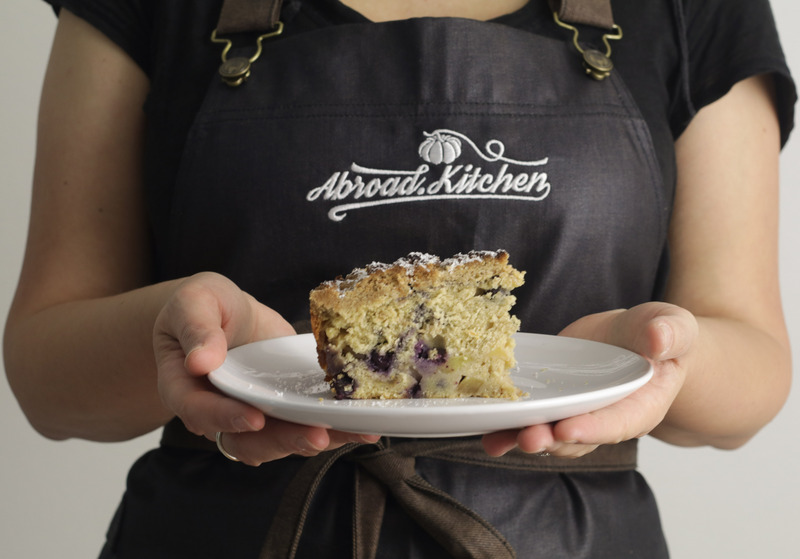 Transfer the dough into a wooden board dusted with flour, and knead for about 10 minutes until you reach a smooth texture and all the ingredients are well combined. Divide the dough in small pieces (40g each) and roll it out, it shouldn’t stick to the board. if it does, add a bit of flour. Form small circles and press one side only into granulates sugar. 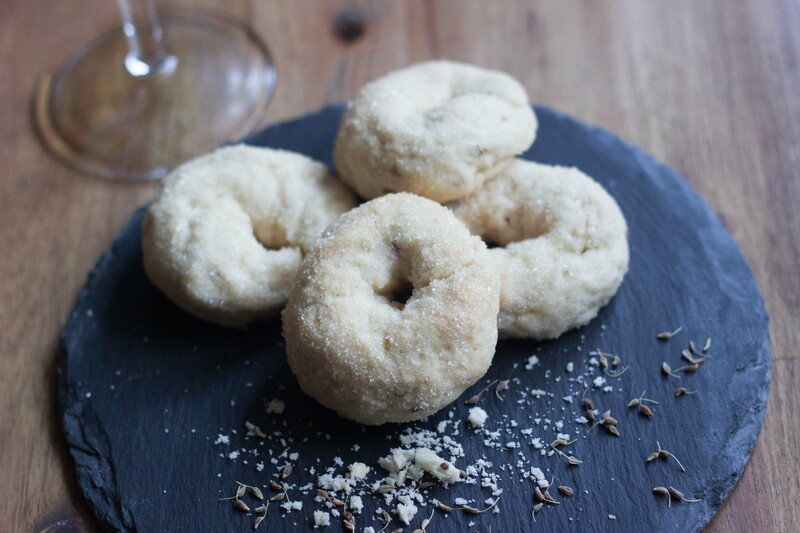 Preheat the oven at 180º and cook the ciambelline (small doughnuts) for 20/25 minutes max. Please note that they should be quite pale on the outside. Enjoy! Music? A great classic such as All you need is love, by the Beatles.